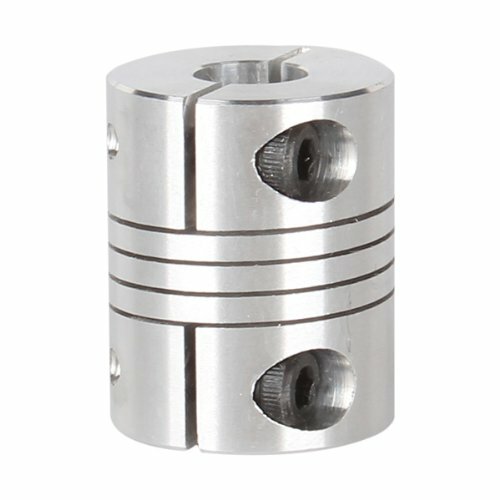 I’m writing here to alert anyone from wasting their time as I have trying to order flexible couplers from this site. I had some screw-in type couplers (where the two screws go into the center of the cylinder) stretch, so I needed to replace them. I had some spare “clamp” style - with a single screw - that I tried to use as in interim solution, but they do an absolutely terrible job at holding the lead screw…I have to tighten them almost to where I’m bending my hex wrench. Early this week, I gave up on the clamps and ordered a set of the good kind from this site, as the flex coupler site shows the ones I need (screwing into the center). I waited all week with a down CNC machine waiting on these couplers, which arrived today. WRONG COUPLERS. 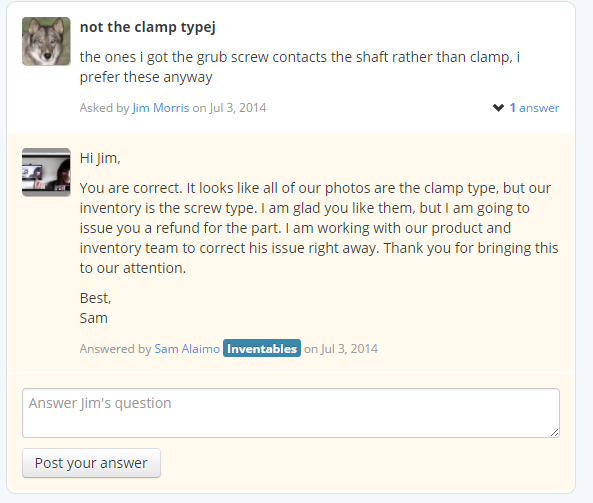 Even though I purchased based on the photo, Inventables is not sending out that kind. They are sending out the bad clamp kind that I just threw away due to being useless (worse, actually, as I’ve lost a couple of pieces of exotic wood because of them). I waited a week to get the wrong kind of couplers, so now I have to order the correct set from China, which takes 3 weeks. Tack on the week I was twiddling my thumbs waiting on Inventables to sent me what they are advertising (falsely), and I have a MONTH OF DOWN TIME over this. The question is - will Inventables ever correct their photo or just keep misleading both current and former customers? I have had good luck with their support. Did you call and talk to them or email them? I had replacement parts in 2 days when I needed them. I understand the frustration at receiving incorrect items, but surely you must have other options than ordering from China? Contacting them will fix your problem. Until someone says something to them, they may be unaware there is a problem. Be carful bad mouthing Inventables my friend. If you go through the proper channels and explain your problem, you WILL NOT find a better company to do business with. They absolutely stand by their product and will bend over backwards to satisfy their customers. I know (and so do many others here) from personal experience. Out of curiosity, can you post of photo of what you actually received from them? http://ecx.images-amazon.com/images/I/418qSAO05SL.jpg <--- This is what I received. https://www.inventables.com/technologies/flexible-coupler <-- This is what I thought I was purchasing, and what I actually need. The one I received (the top one) simply does not grip the lead screw very well. I nearly bent an Allen wrench tightening it to where it would not come loose. Again, I already have 3 of the bad ones, and I just threw them away because they were ruining work; I really did not want to spend a week waiting on another set of what I just threw out. I hate to suggest this but have you tried filing a flat spot on your screw to allow the set screw a place to grab? From the looks of the product page this used to be the opposite issue where they showed the clamp but shipped the set screw type. @SamAlaimo Have a look at this. Jan is dead right!! I have contacted Inventables with issues that my customers were having and found them to be very helpful with everything.... except allowing 3 axis zeroing code to be imported to Easel that is. Sorry, I couldn't resist the chance to throw that in there. Next time you get in a bind such as this, checkout your local Fastenal or Grainger Store as these are available there. The couplers you linked (the ones you needed and thought you were buying) are available for $2 on Amazon with free Prime shipping.